We paid our bill quickly. Passed over $1,000 pesos with little fanfare and jumped on our motorcycle. "Did that guy just say the Dominican Republic MAFIA is looking for him?" Ryan asked. Revving up the motorcycle while I adjusted our bag and wrapped my arms around his waist. "Yes," I confirmed. We needed to leave. Pronto. Ryan pressed the gas on the motorcycle and in a cloud of dust, we were gone from the restaurant. We rode through the Dominican Republic night where it becomes chilly quickly as the sun disappears behind the mountains. The stars begin to emerge, the warm breeze starts to nip first at your arms and then down your body; the hum of bugs increases and you can hear families laughing inside of their homes or outside on their porches, beers in their hands. Then, without warning, motorcycle lights appear behind us. "What is that?" I ask, looking behind us. But really, I was asking who is that?! The lights drew closer and closer as we navigated around curves in the road. "They're getting closer," I said, my fear growing. Had the mafia seen us talking to that man? Ryan sped up. But the lights just came closer. Every time I looked back to gauge their closeness, I was blinded by the lights that were - confirmed - very close to us now. "They're following us!" I said, now at full alert. Then, suddenly, the lights cut off to the left and the motorcycle was right beside us! "BLACK COWS!" Yelled the voice. "BLACK COWS!" "It's Cliff," Ryan said, which immediately dissipated my fear. It was a sailing friend from the local marina wanting to warn us about black cows that like to sit in the middle of the roads at night to soak up the warmth left over from the sun. We both pulled into the marina, safely. "Cliff! We thought you were the MAFIA," I said, laughing but half serious. This story serves as a metaphor of our experience of Luperón. When we first announced our intentions to travel here, we were met with a lot of fear from others. "You need to be careful." "The customs people will come onto your boat." "Have bribes of alcohol and money ready." "That place is full of corruption. You should avoid it." It is easy to swallow all of these things and fill yourself full of fear. But Luperón has been a place full of beauty, kindhearted, well-meaning people who just want to warn you about black cows. This includes the locals. They want to help you, and they have sat there patiently while I flip through my English-to-Spanish dictionary just to say one word. They have filled our bellies full of delicious food, helped us purchase the largest vegetables we've ever seen, given us directions when we've been confused, and helped us navigate and enjoy their country step by step. The fear I experienced was all in my head. I had built it up and turned an innocent guy into a gun-toting mafia man. This is what we do when we don't understand a country, a person, a theory, a project. We create and then nourish our and each others' fear so that it grows before we even give it an opportunity to show us it's not that at all. Then, we ordered a personal pizza ($150 pesos) and a Presidenté, clanked our cups and celebrated our arrival to a new, unexplored-by-us country. We hadn't met any friends yet, but we knew they'd come. Everyone we saw waved and smiled at us with a happy "Hola!" or "Buen dia!" 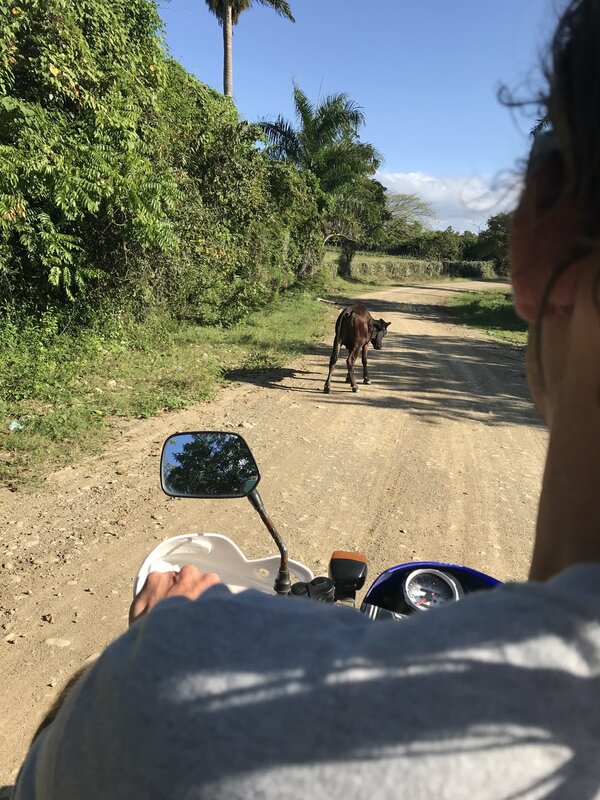 We hadn't met Craig (who would rent us the motorcycle for $10/day) or Cliff (who would hand us a brochure that provided us with information about free clinics, a chiropractor, a dentist, WiFi, and, of course, warn us about black cows). We hadn't met Anna or dined at her excellent restaurant, Las Velas. We hadn't met Hercules, the cutest puppy in the entire world. We hadn't met all of the sailing families who were here as well, doing exactly what we're doing. But on this first day, we simply celebrated this beautiful country with these lovely people. Next up on the blog: Sheena sees the Dominican Republic chiropractor!